C13 church with a tower, but the plan at least may be C11. 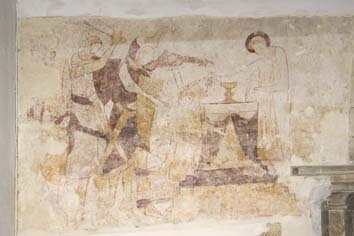 There are C13 or C14 wall paintings. The adjacent manor and church of Preston are mentioned in Domesday Book (3,9) and have been linked ever since. From 1531 to 1879 the living was held in plurality with Hove (VCH 7 p268) for until the early C19 the latter was more impoverished. The late C19 northward spread of Brighton absorbed Preston and church and manor house now stand self-consciously in a park. The plan, a small, unbuttressed west tower with a cap and an aisleless nave, suggests it is C11. If that is so, the length of the chancel suggests it was extended in the C13, the date of the detail throughout the church. 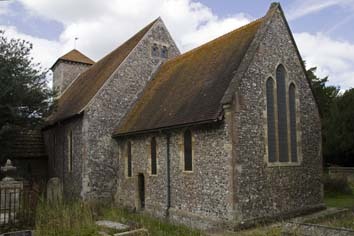 The lancets include west ones either side of the tower and a lowside to the south in the chancel. The east triplet is as shown by Nibbs (c1852) and may be accepted as original in form. 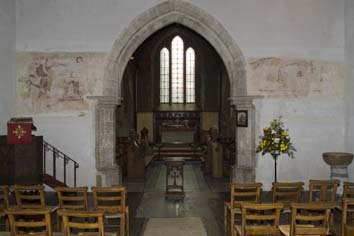 It suggests the later C13, like the tower and chancel arches. These have semi-octagonal responds, with upward extensions, out of which the heads, with two hollow-chamfers emerge; the responds of the tower arch lack abaci. The doorways have hollow chamfered heads. Though superficially unchanged since the Sharpe Collection drawing (1802), the church has been restored at least three times. During work to the interior in 1830 the wall-paintings were uncovered, but this work was not very extensive – Nibbs, who shows the paintings in his plate of the interior (1851), also shows box pews and notes that some lancets remained blocked. 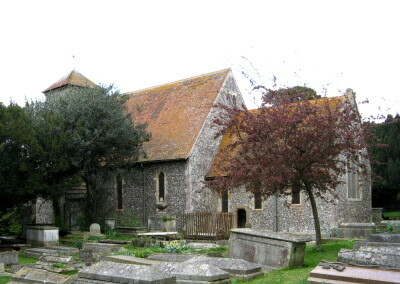 At a further restoration, attributed by The Brighton Gazette in 1874 to ‘Mr Woodman’ (who must be J Woodman – see his BAL Biog file), many lancets were opened and the nave roof was replaced. There is said also to have been undated work by Sir George G Scott (BAL Library transcript p36), but as with other such attributions, this is likely to be an error. Woodman’s work appears to have been limited to the nave, for in 1877-78 E Christian is said to have restored the chancel (Antram and Morrice p206), though it is not in the main list of his works. However, the date 1878 is to be found on the rain-water hoppers, confirming that work was done then, and its roof, with arched braces, is likely to date from this time; so probably does the stencilled wall-decoration. As Preston grew, the inadequacy of the church became clear, despite several new churches in the historic parish. Sir A W Blomfield and Sons made plans in 1899 to extend it, but these were abandoned in favour of a complete new church on another site and, on completion, St John‘s became the parish church. In 1906 fire damaged the tower and nave. 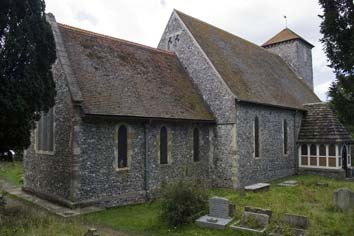 P M Johnston (CDG 157 p127) replaced the nave roof and repaired the tower. He removed a west gallery, spared by Woodman, and the north porch and vestry on the south side probably date from this time. 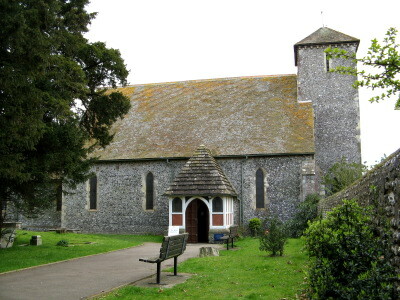 However, no lasting use was found for the church and it became redundant in 1988. It is in the care of the Churches Conservation Trust. Font: According to Hussey (p271) the then font was ‘modern’ and the present one is quite plain and looks entirely C19, though the round stem could be older. Dale (p198) suggests that the bowl is in fact Anglo-Saxon and that it was found in the grounds of the manor. If that is so it has been thoroughly recut but it is more likely to be entirely new, most probably dating from the repairs after the fire of 1906. 1. (North chancel, second window) W G Taylor, 1882 (BA 18 p382) (Trophies of the 19th Regiment/ Captain George Macdonald). 2. (North chancel, first window) Barton, Kinder and Alderson, 1957 (signed) (Medallion of Good Samaritan). 3. (Nave, all north and south windows and two west windows) Lavers and Westlake, 1907 (Antram and Morrice, ibid). It replaced glass destroyed in the fire of 1906. Monument: (Later used as the altar) Edward Elrington (d1515). Tomb chest, not in its original position. On each of four subcusped quatrefoils on the front is a shield. The carving is in excellent condition, possibly because of recutting. Painting: (Nave) Deposition, attributed to Sir E Burne-Jones (BE p460), though improbable on stylistic grounds; N H J Westlake has been suggested as an alternative (EH). 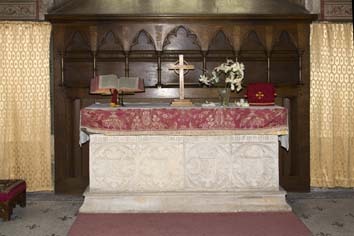 Until 1906 this was the reredos (Dale p197). It was stolen in the 1990s (information from John Vigar). 1. (South east corner of nave) Later C13 trefoil-headed, with a shelf and a broken bowl. 2. 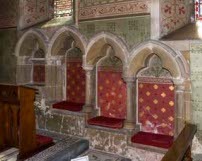 (Chancel) Similar, also with a shelf but with two drains. It is integrated with the sedilia (see below). Sedilia: (South chancel) Restored late C13, with three stepped seats and trefoiled heads on shafts. Wall paintings: (Nave walls and over the chancel arch) Found in 1830 (1 p313) and dated to c1300, though E C Rouse (Lecture at SAS conference, Chichester, October 1981) thought them earlier. They were damaged in the fire, when the upper tier was destroyed. A photograph of those on the north wall of the nave before the fire (In VCH 7, opposite page 268) supports a dating in the later C13. The rest were restored in 1977 (vidi). 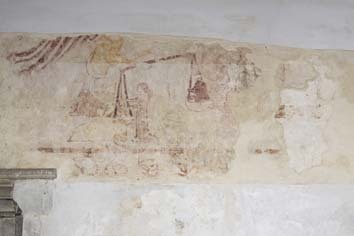 On the north side are fragments of a Last Supper and the Adoration of the Magi, complete with animals looking on. South of the chancel arch is St Michael weighing souls with the Martyrdom of Thomas à Becket north of it. The colour has mostly gone, emphasising the vigorous drawing, though some at least of this may be the work of earlier restorers. My thanks to Josie Campbell for the photographs of the exterior and the general one of the interior and to Nick Wiseman for those of the paintings and sedilia etc.